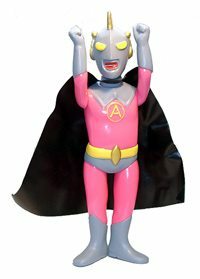 This is “怪傑透明ウルトラエース(Swift Invisible Ultra A)” created by Marusan co.
It’s obviously a bogus hero-like figure. It seems that the production intended to make grown-ups who have little knowledge on hero program buy as souvenir for their kids by making them confusing actually TV-aired hero character. However this fake stuff brought about one of the greatest incidents on Tokusatsu history. The sequel of “帰ってきたウルトラマン(Ultraman JACK or Ultraman the Return)” was supposed to be “Ultra Ace” not “Ultraman Ace”. Tsuburaya production was planning to name this series as “Ultra series” rather than “Ultra-MAN” series. Actually the trailer aired on the final episode of “Ultraman JACK” called the next hero as “Ultra Ace”. However to Tsuburaya pro’s dismay, the name “Ultra Ace” had been already registered as trade mark. Yes, the toy maker of this petty character had the audacity to insist on its copyright. Due to this claim, “Ultra Ace” had to change its name into “Ultra-Man Ace”, and its theme song was retaken. If this character hadn’t existed, the sequel heroes would have been “Ultra Taro”, “Ultra Leo”, and furthermore we would have “ULTRA ORB” now.